I love how crisp & clear this shot is. I also love that it is candid. Great colors, too, against that snow! And nice framing. Agree with April. The composition is also nice. I\'d like to know what these \'dramatic events\' were. What kind of things would you be talking about then? Lovely image…liked the color contrast and texture of the ice! Harry, if you have some pix of "beautiful" 2nd step…please post. 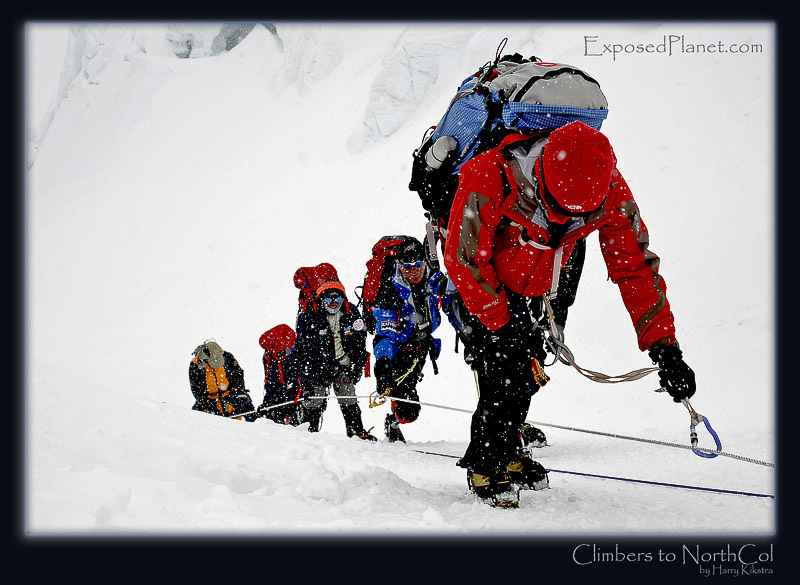 The story behind "Climbers towards North Col of Everest, Tibet"
Shot at about 6900m altitude, this group of climbers is close to their goal of the day, the North Col of Everest, while the snow is falling down. Climbing Everest might technically be not so difficult, but anyone who says it is not hard has obviously not been there. Camera worked like a charm, even when hardly protected and in snow and windy and cold conditions.